Hello everyone hope you are all having a positive week. Beautiful weather here on the West Coast of Florida. sunny and just beautiful windows open. I enjoy playing along in all challenges, and I love anything crafty. I enjoy creating each of my cards. today I used Red, White card stock . I used scrap papers for my Heart. 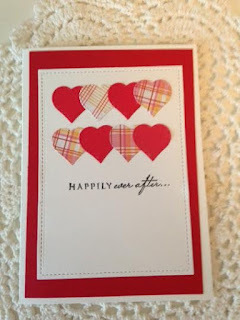 I used my Misti and then used my clear stamp HAPPILY ever after. Thank you for visiting my blog it is always a blessing and Honor to have you stop by . Love how you used the hearts and scrap/pattern paper! Thanks so much for playing Simon Says Stamp Wednesday “The Color of Love” Challenge! Beautiful colors and design. Well done! I love your mix of patterned hearts! It definitely says "Happily ever after". Thank you for playing along with us at Freshly Made Sketches. Thanks so much for sharing your lovely card in our challenge at Word Art Wednesday. I love seeing your cards linked up and I hope that you will join us again just as soon as you're feeling up to it again.